The TV series "Futurama" will air in its entirety on the Syfy channel, starting Nov. 11. Good news, everyone! 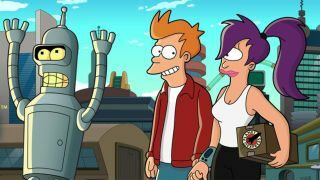 The hit space-comedy series "Futurama" will air again, this time on the TV network Syfy, starting on Saturday (Nov. 11). Syfy will air the series regularly on Mondays and Tuesdays from 8 p.m. to 2 a.m. Eastern Time/Pacific Time, and on Saturday mornings from 8 a.m. to 11 a.m. Eastern Time/Pacific Time. The 140-episode animated series, which originally ran on Fox and Comedy Central, focused on pizza-delivery boy Philip J. Fry. He was frozen cryogenically for 1,000 years and found new employment at an interplanetary delivery company called Planet Express. The series ran between 1999 and 2003 on Fox and had four direct-to-DVD movies released starting in 2007. Comedy Central picked up the movies and then ordered three more seasons that ran between 2010 and 2013. "Futurama" won six Emmys during its run. It was created by Matt Groening, who is also known for iconic animated series "The Simpsons." "We're continuing to invest heavily to give our passionate fans the very best in genre programming, and I can think of no better addition to Syfy's lineup than one of my personal favorites, 'Futurama,'" Chris McCumber, president of Entertainment Networks (USA and Syfy) for NBCUniversal Cable Entertainment, said in a statement. "Futurama" joins other space and science fiction series on the network, including "The Expanse," "The Magicians" and "Channel Zero." The network also plans a Superman prequel in 2018 called "Krypton," an adaptation of George R.R. Martin's space opera novella "Nightflyers" and a reboot of the 1990 cult-hit film "Tremors."